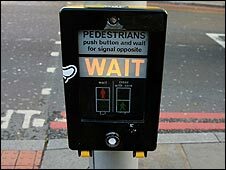 BBC News - Is dawdling on a pelican crossing illegal? "You would probably find that that would be obstructing the highway, but what he would say is 'I'm pressing the button'. The court would have to decide whether it is a reasonable use of the highway. "A court might decide if he is doing it to prevent the passage of vehicles. It is a novel point but he is impeding the passage of vehicles and that is the purpose of the highway." This might more typically involve an obvious blockage - a parked car, stationary object or sit-down protest. Why did the human cross the road slowly? 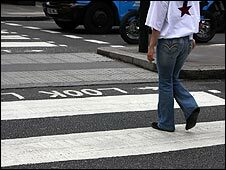 The Zebra, Pelican and Puffin Pedestrian Crossing Regulations and General Directions of 1997 are not the most fearsome bit of legislation in the police's pocket, but regulation 19 bodes ill for Mr Fuller. "No pedestrian shall remain on the carriageway within the limits of a crossing longer than is necessary for that pedestrian to pass over the crossing with reasonable despatch." The penalties are not immediately obvious in the wording of the law, but it would most likely involve a summons, appearance at magistrates' court and a small fine. Of course, the law does not define what is "longer than necessary". And an older or disabled or unwell person might easily argue that they need lots of time to get across, says Mr Young. Other legal avenues are not easily forthcoming. An Asbo might be one option, says Mr Young, but Mr Fuller's behaviour seems unlikely to cause "harassment, alarm or distress". And "he is not causing a breach of the peace", notes Mr Young. "The local magistrates might have sympathy. It isn't an offence which is capable of carrying imprisonment," says Mr Brown. "Any sensible bench would conditionally discharge him and say grow up."